Therapist Ross Scales's gentle Reiki moves help Kathryn Zorn relax when she returns to her room from chemotherapy. When Kathryn Zorn’s doctors in Arizona couldn’t pinpoint the illness that kept her in and out of the hospital for months, she checked into Ronald Reagan UCLA Medical Center. Physicians here quickly diagnosed her with leukemia and immediately called for aggressive chemotherapy. But Zorn’s treatment plan includes something else: aromatherapy coupled with Reiki, a Japanese vibrational energy therapy that is delivered through a practitioner’s very light touch or no touch at all in an effort to balance the human biofield. 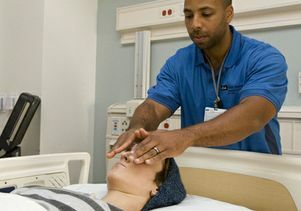 Aromatherapy, Reiki, yoga and mindful awareness practices are now being offered by current hospital staffers trained to deliver these healing techniques to patients who request them, thanks to UCLA Health Systems’ new Urban Zen Integrative Therapy program. Tired and disconcerted after an hours-long chemotherapy infusion in the busy oncology treatment center, Zorn returned to her hospital room one recent afternoon to find massage therapist Ross Scales, who has worked at UCLA Rehabilitative Services for more than a decade, ready to begin a session using Reiki with aromatherapy. Scales, whose quiet presence seemed inherently calming, arranged a soft cloth over Zorn’s eyes and dabbed drops of fragrant oil on her palms and the bottoms of her feet. He then gently positioned his hands on her feet for what seemed like an endless minute to "ground" her, as he explained later. "It kind of slows everything down." Next, with the lightest of touches — and sometimes not even touching but his hands hovering ever-so-slightly above — Scales moved on to Zorn's abdomen, the top of her head, the back of her neck, her shoulders. Silently, he watched Zorn’s face and observed the rise and fall of her chest as her breathing slowed and she drifted off to sleep. About 20 minutes after he began, he concluded by once again touching Zorn’s feet and gently removing the cloth from her eyelids. Opening her eyes, she told Scales, "It just makes your body…whoosh! It just relaxes everything." And while she was aware that his hands had not been touching her for most of it, she reported feeling "a warm energy — not a warm temperature but more of an energy — a nice feeling especially when you haven’t been feeling good. I’ve been feeling some nausea and stress … but the noise all goes away and the world is at peace." Zen-like peace was just what renowned fashion designer Donna Karan was aiming for when she created the program in 2001. Her husband, Stephan Weiss, was dying of lung cancer in a New York hospital, and she became distressed to find no access to yoga or other complementary therapies to ease his suffering. 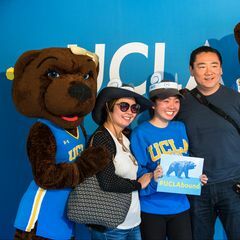 While Urban Zen has since been established in several hospitals on the East Coast, UCLA’s is the first medical center on the West Coast to adopt it. So far, 27 UCLA hospital staffers who wanted to learn to offer these techniques as part of their jobs have undergone an intensive, three-month training program led by certified Urban Zen instructors, said Ellen Wilson, director of the medical center’s wide-ranging therapy services, including Urban Zen. Another 61 are in training. Therapists learn to address a set of classic symptoms known by the acronym PANIC: pain, anxiety, nausea, insomnia, constipation and exhaustion. Training will continue on an ongoing basis, Wilson said, to support the ultimate goal of having 250 to 300 personnel available throughout the health system, including the hospitals in Westwood and Santa Monica as well as at outpatient clinics. "A lot of people want to do it," said Wilson, who noted that training is open to anyone who has direct patient care responsibility. Once trained, these staffers will provide these therapies to patients in areas where they currently work. Nurses comprise more than half of those who have signed on, but physicians, physical therapists, respiratory therapists, radiology technicians, social workers and others are also taking part. In addition to honing their skills in aromatherapy, Reiki, yoga and meditation, trainees learn to adapt these techniques to patients’ needs — for example, using modified yoga postures that a patient can perform in a chair or in bed. They also learn to treat with caution patients who might be particularly vulnerable, such as those who are recovering from open-heart surgery. 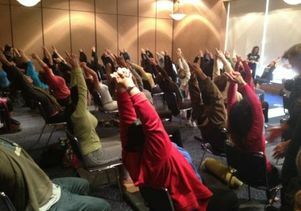 During their training session, Health System staff members practice yoga poses that can be done in a chair. "I was ecstatic about training," said Scales, who was part of the initial group to train. "I couldn’t wait to do it. Now I have more healing modalities that I am blessed to be able to bring to UCLA. It’s wonderful." The use of these techniques in health care is still something of an emerging field and yet to be well-founded scientifically, said Wilson. Thus far, research has established that, at core, these techniques have a placebo effect. "If a patient thinks it’s going to work," she said, "it’s going to work." Urban Zen techniques have proven very effective in reducing the need for heavy doses of pain medication for oncology patients. But hospital staffers at UCLA are interested in using Urban Zen in a variety of ways. Lined up for training are a group of phlebotomists [who take blood samples for tests] who want to help anxious patients relax during procedures. Radiation therapists think the techniques would help calm patients who feel claustrophobic in the confined spaces. Anesthesiologists hope these new therapies will relax worried patients before surgery. And heart transplant specialists are talking about using Urban Zen with patients both before and after surgery. "It’s a way that we can give something to patients that doctors and nurses [can’t always] give," said Scales. "Doctors and nurses care greatly, but so often they’re coming into a patient’s room to update them on reports or give them medications or things that can make them very anxious. 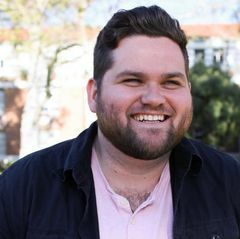 "I get to come in and do something completely different," said Scales. "I get to give them this beautiful therapy." Learn more at UCLA’s Urban Zen website.